Pain behind the knee can have a serious impact on your daily activities. Sharp pain at the back of your knee can affect walking and cause discomfort when standing or walking up stairs. Pain and swelling behind the knee can also cause stiffness in your knee joint, inflammation, and possibly, a lump at the back of your knee. There are many reasons for mild to severe pain behind the knee. For example, a ligament tear, a pulled muscle, fracture to a bone in your knee, or wear and tear can also cause varying degrees of pain behind the knee. The knee pain can cause you to limp, make it difficult to walk, or you may not be able to bend your knee at all. Knowing how to treat pain behind the knee requires knowing what is causing it. However, usually, hot and cold treatments can help to restore mobility to your knee joint and ease the pain. In some cases, if the leg pain behind the knee is caused by blood clot or cyst, you need to get it checked out by a doctor. In this article, you will learn about the various reasons why you could have pain at the back of your knee. Pain behind the knee is sometimes referred to as posterior knee pain. 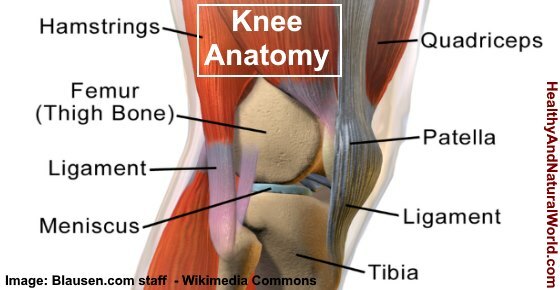 Your knee joint is made up of ligaments, tendons, cartilage, muscles, and bones. For example, your hamstring is at the back of your thigh and helps to flex the knee. However, a pulled hamstring will cause pain in your thigh and at the back of your knee. Let’s look in more detail at the various reasons why you could be suffering from aches and pains behind your knee or at the back of your leg. An injury to your hamstring is a very common reason for sharp pains at the back of your knee. Your hamstring starts at the bottom of your pelvic bone and crosses the back of the knee and ends at the lower leg. Doctors from the American Academy of Orthopedic Surgeons say that your hamstring helps you bend your knee. Dr. Tyler Wheeler on WebMD says that you can prevent hamstring injuries by warming up before exercising. You should also strengthen your glutes which make up your buttocks to prevent extra strain on your hamstring muscles. At the end of the article, you can find out how to treat a pulled or torn hamstring and help ease the pain behind your knee. Excruciating pain in the back of your knee can often be the result of a torn ligament in the knee joint. Anterior cruciate ligament (ACL) injury is a common reason for knee pain. Posterior cruciate ligament (PCL) can be injured if there is extreme trauma on the knee. Depending on the severity of the ACL or PCL injury, you may need surgery to restore strength and movement to the knee joint. Experiencing stiffness and pain behind the knee could be due to injuries to the delicate structures in the knee. These types of injuries are referred to as posterolateral corner (PLC) injuries. Feeling constant pain behind knee cap could be caused by a compressed nerve in your knee joint. Nerves from your lumbar region and nerves in your leg can cause varying degrees of pain if they get pinched or trapped. A Baker’s cyst will cause a lump at the back of your knee along with pain and discomfort. The cyst that forms at the back of your knee is usually caused by arthritis or tearing a cartilage. This results in a buildup of fluid that causes a lump behind your knee. Leg pain behind your knee could be due to damage or injury to the main muscle in your calf. Your main calf muscle is called the gastrocnemius and is located at the back of your legs. Repetitive strain on the gastrocnemius can result in muscle stiffness or tightness which can be felt at the back of the knee joint. As with many conditions that affect the knee joint, physiotherapy can help to relieve pain and restore movement to the sore knee joint. A condition called “tennis leg” can also cause pain in the back of your leg behind the knee. Tennis leg is associated with damage to the gastrocnemius where damage to the muscle and the soleus muscle in the calf causes a buildup of fluid. There are some occasions when pain behind the knee can be caused by a blood clot in your lower leg. Another type of injury that can cause pain and swelling behind the knee is tearing cartilage tissue in your knee. Injuring your popliteus tendon or muscle can be a cause of pain behind the knee that makes the knee joint unstable. In many cases, home remedies are enough to treat back of knee pain and help speed up recovery. Here are some of the most popular methods that doctors recommend. Successful recovery of damage to tendons, ligaments or muscles in your knee joint depends on proper first aid treatment. The best first-aid treatment of muscle tears or pulled ligaments is the R.I.C.E. method. Rest the affected knee by stopping any activity that causes pain or soreness. Placing a small pillow under your knee can help to reduce knee pain when lying down. Ice the affected knee with a cold pack immediately after sustaining an injury to your knee. Apply for 10 to 20 minutes 3 or 4 times a day to reduce swelling and prevent bruising. Compress the injured knee joint by wrapping an elastic bandage around the knee. The bandage shouldn’t be so tight that you have tingling or swelling below the bandage. Elevate your injured knee to keep your knee above the level of your heart. Dr. Blahd says that ice should be used for the first 48 to 72 hours to reduce swelling. When the swelling has reduced, you can apply heat to help increase blood circulation and accelerate healing. After 2 or 3 days use a warm compress to help get rid of chronic pain at the back of your knee to improve flexibility and strength in your knee. Fill a clean cotton sock with dry rice almost to the top, leaving enough room to tie the sock. Put the sock in a microwave and heat on full power for 1-2 minutes. Dip a washcloth in hot water and wrap the cotton sock in it. Hold for 15 minutes to the back of your knee to relieve the pain. Repeat 3 or 4 times a day to help speed up healing and get rid of behind the knee pain. Other exercises that are great for strengthening knee joints and alleviating pain are swimming, water aerobics, walking, and stationary cycling. If you are recovering from an injury that has caused severe pain behind the knee, you should talk to your doctor or qualified physiotherapist for advice on the best types of exercises for your condition. If you have to manage long-term pain at the back of the knee, you can try some natural pain-relief remedies at home. Some herbs and spices have natural pain-relieving properties that can help reduce inflammation in joints and can manage knee pain successfully. For more information and precautions on using turmeric for pain relief, please read my article about the best herbs to reduce joint pain. Other herbs and spices that can help to alleviate pain are ginger, flaxseed, and cayenne pepper. Other essential oils that you use as anti-inflammatories and can help to get rid of pain behind the knee include peppermint oil, rosemary oil, and helichrysum essential oil. If the home remedies in this article don’t help reduce swelling and pain behind the knee, then you should visit your doctor for professional advice. Swelling at the back of the knee or around the kneecap. Inability to bend your knee, or bending your knee causes severe pain. Pain that interferes with your daily activities. WebMD. Picture of the knee. WebMD. What are knee ligament injuries? Rev Bras Ortop. 2015 Jul-Aug; 50(4): 363–370. Medscape. Nerve entrapment syndromes of the lower extremity. J Can Chiropr Assoc. 2013 Dec; 57(4): 341–349. Radiol Case Rep. 2017 Mar; 12(1): 120–123. WebMD. Knee problems and injuries – home treatment. MedicineNet. Arthritis or injury: Ice or heat. WebMD. 11 Knee pain dos and don’ts.